The Fiat 500 Abarth is unquestionably one of the most entertaining cars sold in the United States for someone who loves to drive but word on the street is that Fiat is considering offering an automatic transmission in the Abarth – killing some of the fun while offering hope for those who lack the coordination to deal with the standard manual transmission. While speaking with Ward’s Auto, Fiat's North American president Tim Kuniskis stated that the company wasn’t opposed to the idea of offering the Abarth with an automatic transmission but they didn’t do so from the get-go because they didn’t think that there would be enough public interest. Turns out, there is quite a bit of interest and that could lead the company to offer an automatic transmission for the Abarth in the near future. One of the reasons that they are considering this is that with the arrival of the 500C (convertible), Fiat expects more female buyers who want the style and extra punch of the Abarth. Evidently, while I know plenty of women drivers who are more than capable of shifting their own gears, more female buyers means more demand for automatic transmissions and meeting that demand makes good business sense. 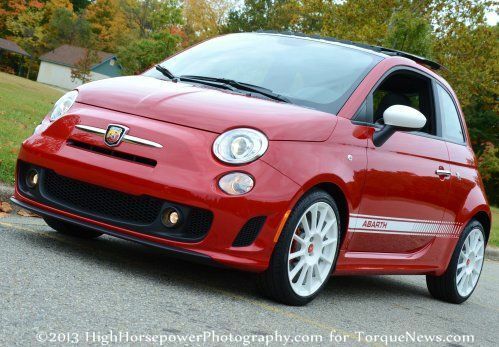 Unfortunately, that smart business decision comes with the cost of watering down the fun factor of the Abarth 500. While looking at the specifications of the Fiat 500 Abarth on paper might lead someone who hasn’t been in one to question just how much fun this tiny Italian compact can be – anyone who has driven one will almost certainly speak fondly of the experience. Even with “only” 160 horsepower and 170lb-ft of torque, the 500 Abarth falls well short in power compared to pretty much any sports car sold in the US but the Abarth is lightweight and tiny – allowing you to throw the car through turns like few other cars on the market. This isnt a car that it going to tear up the drag strip in stock form but with a price tag starting at just $22,000, this is (in my opinion) the best bargain sports car in the US market. One of the most entertaining things about the Abarth is the great feel that you get for the road and the drivetrain which includes endless gear banging fun from the Abarth’s close ratio 5-speed manual transmission. Removing the manual transmission from the Fiat 500 Abarth takes away one of the most enticing aspects of the car and while it must be disappointing for those who are too uncoordinated to drive a manual transmission to hear it – the effort spent learning to drive stick is well worth the benefits. I suppose that the good news about a Fiat 500 Abarth with an automatic transmission is that Fiat has a very, very strong dual clutch transmission program that covers a range of vehicles spanning the Fiat 500 (and the Dodge Dart) all of the way up to the top of the line LaFerrari supercar. Fortunately, the advancements in dual clutch technology have made them vastly more efficient than a traditional fluid driven automatic transmission so self-shifting sports cars don’t have to suffer the huge loss in wheel horsepower but no matter how great a dual clutch setup is – they just don’t offer the same level of driving excitement (all else equal) as a good old manual transmission. Luckily, a Fiat 500 Abarth with a dual clutch automatic transmission will still offer the incredible handling capabilities of the current Abarth so drivers of these self shifting 500s will still get to enjoy that aspect but there is little doubt in my mind that the devout Fiat performance fans around the US will be quick to turn their noses up at the idea of an Abarth 500 with anything but a manual transmission. Then again, there may be a larger group of people who want an automatic 500 Abarth than those who will complain about them on Facebook and in the end – the people writing the checks to buy vehicles are the ones that the automakers care about the most. In the end, even with an automatic option on the build sheet, proper sports car fans who are shopping for a Fiat 500 Abarth will still be able to opt for the 5-speed heavy duty transmission that adds to the carnal fun of the mighty little Abarth. Some might consider it to be blasphemy to put an automatic in the Abarth but if it helps the company grow without hurting those who want more performance – it is the smart decision by the company. That being said, if you are in the market for a car that is incredibly fun to drive, inexpensive and very efficient, you might want to check your local Fiat dealerships to see if they have an Abarth on the lot.